For anyone who half-way knows me, they are aware that I love construction. The idea of building things has always intrigued me and I remember being a little boy who spent countless hours assembling Legos or stacking Lincoln Logs. Today, I work in project management for a mid-sized general contractor whose main focus is in the water industry. We build the large steel water tanks on the hillsides, concrete reservoirs, water filtration plants, pump stations, and water treatment facilities, to name a few. Basically, we build the facilities that send clean water to your sink and tap. I intend to make a career out of what I do, and if I could control the future, I would work for my company until retirement. There is something quite satisfying to build such permanent things. Ten or fifteen years from now, I will be able to take my children to the many projects I’ve completed and show them what I did during my early 20’s. There is also the reward of building things that makes other people’s lives easier and better. 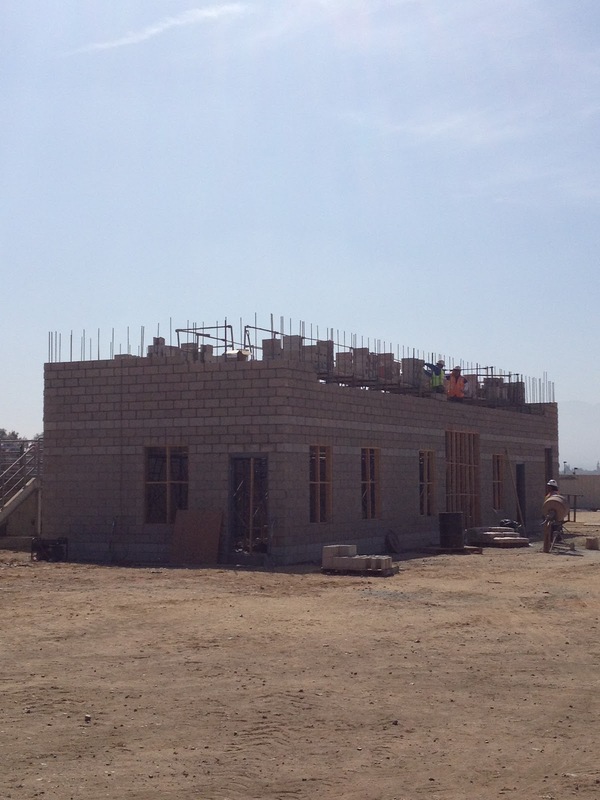 The picture I’ve attached is of a control building that is part of a small construction project I am currently managing. On the left side of the building is a huge concrete structure that contains water that will be treated and recycled for use. In very simple terms, my scope of work for this project includes the building, new stainless steel air piping for aerating the water, and new walkways over the concrete structure. Inside the building are huge air blowers. These blowers will force air through the piping and into the water. In the back room of the building is the MCC, switchboard, and control panel. Those important pieces of electrical equipment will control the air flow by opening and closing the valves and regulating the amount of air being produced by the blowers. It’s a simple theory, but the little pieces all have to be figured out so the project can run smoothly. My job is to take care of the details without losing sight of the big picture. So I make sure all the materials and equipment for this project are approved by the engineer and meet all the necessary requirements. Then I order the materials in the correct quantities – down to the number of blocks needed for the building. I help my site superintendent figure out the plan of our work. An important part of this step is scheduling the project. Using scheduling software, I figure out all the steps necessary for each piece of work, how long each step of work will take, and which step must be completed before the next step can take place. As the work progresses, I keep the owner and engineer appraised of our progress by updating the schedule I made and by submitting progress payments where I bill for completed work. Billing can be complicated. You can only bill for completed work and you must make sure that you bill enough to pay all the bills that month from your suppliers and subcontractors and still be able to pay your crew. As invoices start to come in from suppliers and subcontractors, I review them to make sure the quantities and prices are correct before approving payment. When there are problems in the field with gray areas or instances where something will not work like it is drawn in the construction prints, it is my responsibility to review all the information and determine whether or not a change order is warranted. If so, I will write a letter to the engineer explaining my company’s position on the issue and provide a full-breakdown of extra costs for the work to be done. It takes effort to prepare and negotiate a fair change order that keeps all parties happy and the work on schedule. There are four main factors in construction projects that must be managed carefully in order to be successful: cost, time, safety, and quality. Cost: you cannot run over budget. There are a lot of things involved in construction and there are millions of dollars to spend and track. The tighter you run your project and the more attention you pay to details, the less money you waste and the more profit you earn. Time: no one likes delays. Delays mean liquidated damages and must be avoided like the plague. The work has to be planned to take the maximum advantage of the time you have to complete the work and make sure that materials and subcontractors are not late. Safety: your crew is your most valuable asset. You must take good care of your crew and make sure that when they are working they are safe. Reason number one, no one wants to get hurt. Reason number two, injuries can shut a project down and/or put a company out of business. Quality: you have to do good work. I am lucky to work for a company that has a sterling reputation for doing great work, and I intend to live up to that reputation. Plus, who wants something built that is shoddy or sub-par? If you’re going to do something, do it right. All of what I’ve written is what I love doing. I am so privileged to work for a company who trusts me with this responsibility and I intend to become an expert at what I do. There is still so much for me to learn that will help me progress and do a better job, but fortunately I am surrounded by talented professionals who mentor me and want me to succeed. And succeed I will.